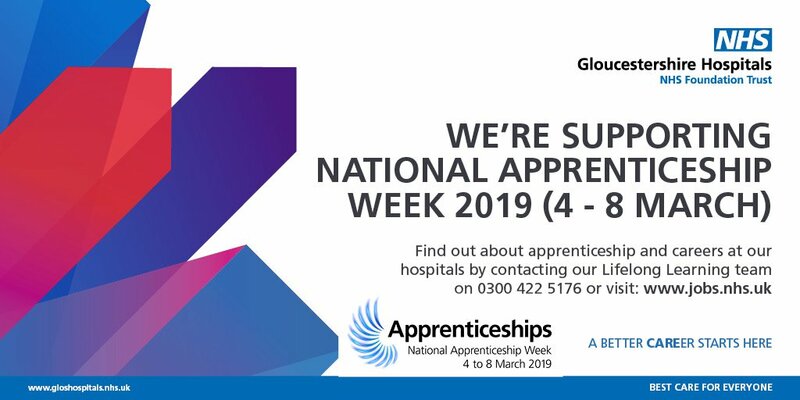 18 Feb 2019, 2:13 p.m.
Gloucestershire Hospitals NHS Foundation Trust is taking the opportunity to highlight apprenticeship at Gloucestershire Royal and Cheltenham General Hospitals throughout the week. The week, which is co-ordinated by the National Apprenticeship Service - and also coincides with National Careers Week - is designed to celebrate apprenticeships and the positive impact they have on individuals, businesses and the economy. Our Head of Lifelong Learning Lucy Blandford explains: “What better opportunity than Apprenticeship Week to recognise apprentices who are working at our hospitals? “Good quality education and development are fundamental to providing are services and in particular, to continually improving the experience of patients. At our hospitals we are committed to providing education, training and development that enable us to deliver safe, dignified and compassionate care. “Staff progression and access to further relevant learning is important for our organisation and our apprentices across different job roles and different apprenticeship frameworks have secured employment and progressed to higher level apprenticeship qualifications. Katie Pellatt is an Apprentice Health Care Support Worker at Chedworth and Kemerton Day Surgery Units based in Cheltenham General Hospital. “I chose to complete this apprenticeship in order to have a years’ worth of healthcare related training and ensure my decision to become a nurse was exactly what I want to do for the rest of my life. I have been really enjoying it so far and it has made me certain that nursing is the right career for me”. “I decided to do an NHS healthcare assistant apprenticeship to gain experience and a valuable qualification to help me in my aspiration to become a nurse. I currently work on a rehabilitation ward and the experiences I have come across have made me realise the passion and care that goes into helping individuals regain their independence. This apprenticeship has spurred me on to achieve my goal to be a nurse with the NHS”. “I wasn’t sure exactly what I wanted to do when I first started looking for apprenticeships but I had done my work experience in a nursery and quite enjoyed it. So I applied for an apprenticeship within the NHS and I got the job within one of the nurseries. I’m currently gaining more skills now being in the position I am in and have been given the opportunity to go on more courses to progress even more. I would 100% recommend an apprenticeship, you get 3 in 1: Money, qualification and experience. I feel like you learn so much more when you have hands on experience and it makes it easier to do your coursework because you can speak from experience”.